This entry was posted in photos, travel and tagged buffalo, clouds, national parks, photos, sky, skywatch friday, travel by Lilli Day aka bookbabie. Bookmark the permalink. 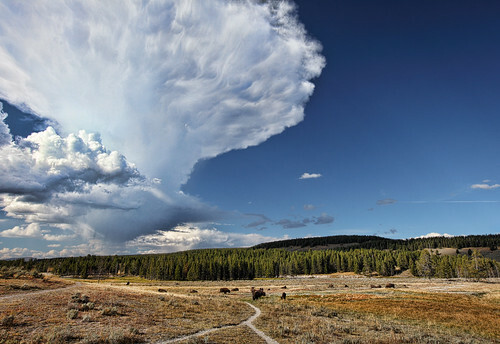 It’s a BIG beautiful sky over Yellowstone, where the buffalo roam. Nice captures. I’ve never been to Yellowstone….your photos make me want to book a trip today! Just great! stunningly beautiful. The West is a wonderful place to live. We have skies like that all the time. Beautiful pictures though in a beautiful area of the country. 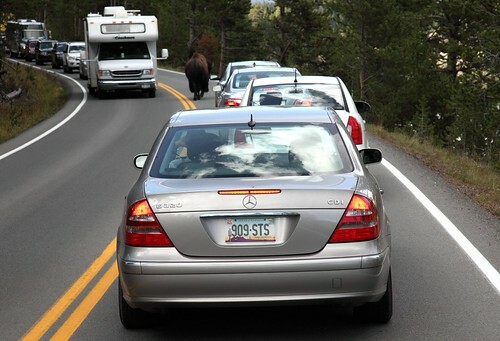 The traffic wasn’t bad at all Betsy, except when the buffalo’s got in the way. September is a great time to go west, cooler temps and hardly any crowds! Awesome! That photo of the sky is so gorgeous, with that amazing cloud above! And the buffalo – oh I just love all animals in nature – I hope none got hurt. Oh no, they don’t get hurt, they have the right of way and the traffic pokes along and waits for them! That’s one amazing sky, and the buffalo shot is phenomenal. You must have a LONG lens there, girl! I read the posts below and am very touched. The one about Aunt Bessie, how blessed you are to have her, so inspiring. And your dad, touched by an angel. I do hope the visit did give him some peace. Thank you so much for visiting. I like your blog very much. Two fabulous pics. I’m sure that cloud formation has a name ~ but I’m not sure what! 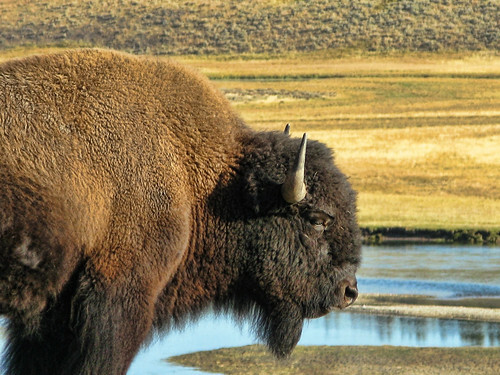 And the Buffalo is such a majestic beast ~ and the colours in the photo gorgeous. I love the buffalo’s expression….such chilled control. And the first shot is classic too – you’ve really captured a sense of openness. Wow! this is a spectacular capture!